Putin is out front in the race for president he has yet to officially join, while the People’s Freedom Party strategizes from its dark corner. Prime Minister Vladimir Putin is still the leading candidate for his former job. According to a recent Levada Center nationwide poll, a little more than one fourth of Russian voters (27 percent) said they supported Putin if he makes another bid for the presidency, a number nearly twice as high as the percentage of voters polled who supported the incumbent, President Dmitry Medvedev. At the same time, Russians are less enthusiastic about the unregistered People’s Freedom Party, and its ability to put forward a democratic opposition candidate, the leading research and public opinion organization said. 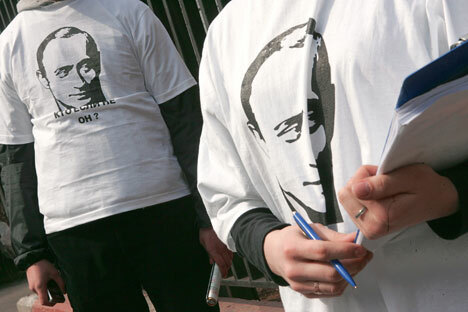 Twenty-seven percent of Russians would like to see Putin running in the March 2012 presidential election, while 15 percent favored Dmitry Medvedev. Nineteen percent of those polled would like both politicians to take part in the race, while 23 percent do not want to see either of them (up 5 percent from December 2010). Twenty three percent would be willing to vote for Putin if they had to vote the day they were polled, and 18 percent said they would vote for Medvedev—a much closer margin. Six percent of voters said they would vote for Communist leader Gennady Zyuganov on election day, while longtime head of the Liberal Democratic Party Vladimir Zhirinovsky received slightly less support at 5 percent. Twelve percent said they would not go to the polls at all, and 22 percent said they will vote but are undecided. Meanwhile, the generally lesser-known democratic opposition does not garner much attention or support. About half of Russians would not support any top figures from the unregistered People’s Freedom Party (Parnas) as presidential candidates, the opinion polls revealed. Boris Nemtsov is slightly ahead, with 6 percent of respondents saying they would support him in the election. He is followed by Vladimir Ryzhkov and Mikhail Kasyanov, with 5 percent each.